These printable Mother's Day cards are a great, easy, and free way to let the mom in your life know how much she means to you and how much love you have for her. Some of these printable Mother's Day cards can be customized before printing with photos and greetings, while others need to be printed first and then you can hand write your message on them. Just follow the directions on each of the websites to get the best results. Your mom will appreciate that these printable Mother's Day cards can be customized just for her and that she's raised you to be a smart consumer who doesn't pay for anything you can get for free. You might also like these free coloring pages for Mother's Day. She'll love to get these free, printable Mother's Day coupons as a gift. This printable Mother's Day card features hand lettering and beautiful watercolor florals. It's a perfect card for any mom in your life. The card is available as a folding card or as a 5x7 print. After you print, simply cut along the dotted lines and fold the card. You'll then need to add your message and sign your name. Minted Strawberry has designed this bright and beautiful printable Mother's Day card that's completely free to download. 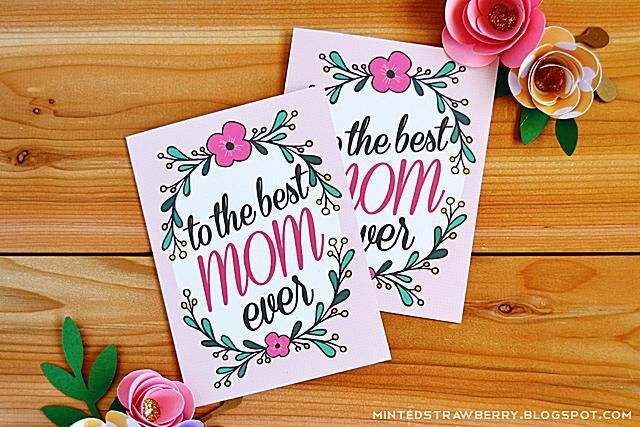 Hand drawn flowers and vines in bright pink and greens decorate this card along with the phrase "to the best mom ever". How can a mom not love this card? This card prints out at 4" x 5.5" and can be folded to make a complete card. The inside is left blank so you can personalize it with your own Mother's Day message. The Amazing Mom card from Kori Clark is a great Mother's Day card that a child can give. Place it in a frame, and it makes a quick and easy gift that she'll love. This card asks the child (or grown-up if the child can't write yet) to fill in what their mom loves to do, her favorite food, what she works hard at, where she likes to go, and fun activities she likes to do with the kids. There's a ton of options here, and you can get this card for mom, nana, or grandma. There are also a few other cards here that are just as beautiful. Even if your mom doesn't like to bike, she'll love this happy springtime Mother's Day card from She's Kinda Crafty. The pastel colors and whimsical design will make any mom feel special. In addition to the free Mother's Day card, there's a matching image that you can print out several times and include as a gift of stationery. What a great idea! Here's a free, printable Mother's Day card for the mom who wants something a little different. Delia Creates has designed this bold and colorful "Mama" card that's sure to delight her. There's also a black and white version of the card if you're looking for something a little bit simpler. This beautiful Mother's Day card from Ash and Crafts features red and pink watercolor roses that form a heart along with the phrase "Happy Mother's Day." To print this Mother's Day card, click on the image to make it larger and then print it from your browser onto paper. You'll find five free Mother's Day cards from The Dating Divas; each one meant to tickle mom's funny bone. From thanking mom for making you so gorgeous, to finally admitting that she was right about everything, these fun cards will make mom smile. The Lolly Jane Blog has created three free Mother's Day cards, making it easy to pick the one you think mom would love the best. There's a vintage style "Home is Where Your Mom is" card, a mason jar "mom" card, and a floral watercolor card that says "Home is Where Your Mom is." Each of the cards is a separate download that prints one per page. After you've printed it out, fold it as a half page card. Don't forget that special message for mom! Here's a tiny but beautiful Mother's Day card designed by Pinegate Road. It has a pink watercolor background with "Happy Mother's Day" in gold. In addition to the free Mother's Day card, there's also a printable envelope that when assembled fits the Mother's Day card perfectly. Here's a beautiful free, printable Mother's Day card that any mom would be sure to love. There's also a watercolor stripe card that's free to download if you think your mom would like that one better. Alice & Lois has designed this classic black and white Mother's Day card that's completely free for you to download and print. The message on the front says "You rock, Mama." You can download this free Mother's Day card as a postcard or a 5x7 flat card. These are some adorable printable Mother's Day cards that you simply download and print from your home computer. You'll download a set of four cards wishing the mom in your life a Happy Mother's Day in bright pink, light pink, yellow, and blue. 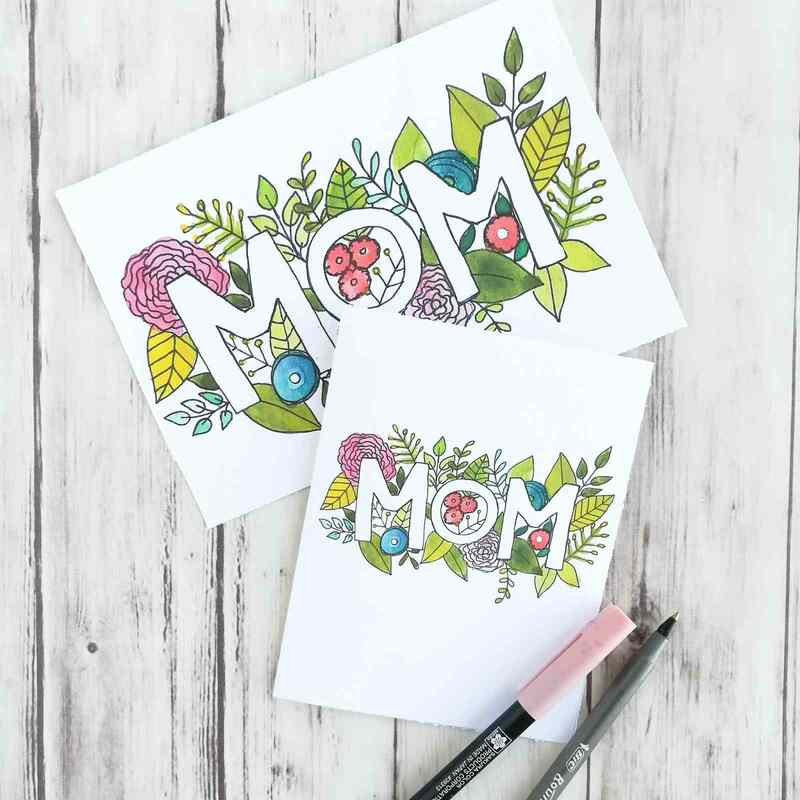 Besides the free printable Mother's Day cards, there are also Mother's Day logos that can be used as stickers, cupcake toppers, or however you see fit. A simple printable Mother's Day card that replaces the apostrophe with a heart. Check out the same post for a free striped Mother's Day card.